The Hakucho Hybrid melon is from Kitazawa Seed. Aromatic, sweet and just over 1 pound, Hakucho is a superior melon. Sugar content is 16%—sweet but not cloying. Their melon selection is interesting, they're all small fruited varieties, so possibly all of them could be container friendly. Maybe I'll work my way through their selection. The Black Cherry tomato is apparently the only truly black cherry tomato in existence. I bought mine from johnnyseeds.com, but thought this site had a better description. I've read a lot of good things about this variety: excellent flavor, open pollinated and disease resistant! I hope they live up to the hype. The Pingtung Long eggplant is from Tomato Growers Supply. These should do well on the roof. One of its other attributes is an ability to thrive and produce continuous, large harvests despite summer heat and humidity. This year I'll grow just one eggplant. Last year, and the years before that, I grew two plants, which frankly was one too many. By mid September I couldn't bear the sight of them, let alone eat one more. I've learned my lesson, grow only what you want to eat. The Caselode peas were from johnnyseeds.com, but they no longer sell them. I've never eaten fresh peas before, only frozen, so I'm curious to see how different they will taste. I think the Flexum Hybrid pepper will be the most attractive plant in the garden this year. Beautiful, 4 oz. cone-shaped peppers start out ivory then mature to yellow, orange, and finally red. The Giant Aconcagua pepper will be the most interesting to watch. The photo on the web site is what convinced me to give these a try. A pepper with flavor as sweet as apples. Oblong fruit grows up to a huge 12 inches long and is produced in great abundance. I doubt I can get them to grow that big in a container, but it will be fun to try. Mountain Magic tomato is my safety play for this year. Flavorful, highly productive, crack resistant, disease resistant to fusarium & verticillium wilt and disease resistant to both early & late blight . The only way I can screw this plant up is if I forget to water it. The plant I'm most excited about is the Summertime Green tomato. I bought my seeds from Tomato Growers Supply late last year. They have since sold out, but they're now available at Heritage Tomato Seed. Summertime Green is from the Dwarf Tomato Project. If you grow in containers pay attention to what this all-volunteer group is doing. They're breeding heirloom flavor, open pollinated tomatoes that are container friendly. Container friendly heirlooms!? Yes, please! What are you growing this year that you're most excited about? Those Giant Aconcagua made me go O_O! They are HUGE!! I can only imagine how well that they are going to do in SIPs. Can't wait to see the results. 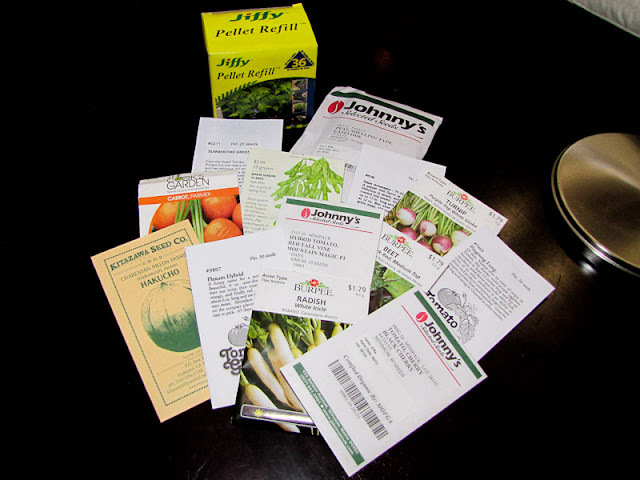 Right now, I'm excited about random seeds that people have sent me from my giveaway. So far, I've received three paprika varieties from the Czech Republic and Hungary. I'm also supposed to get Russian, white tomatoes of some kind (tentatively). Before that, I was stoked about the 10 different kinds of tomato seeds I received (free) from WinterSown.org. Me too! I'm going to harvest the seeds from my 2 open pollinated tomato varieties so I'll have more to give away in winter. I grew a Mountain Magic plant last year. Went really well. The plant was MASSIVE, and it eventually grew to the point that parts of it were sprawled on the roof. It did not seem to care much though, and produced very well. This is very good to hear, thanks James. What a list! Can't wait to follow the progress. This is my first year growing anything from seed, so I'm just excited to see how it goes. I'm especially excited about the two heirloom tomatoes--green zebra and chocolate stripe--and the scarlet runner beans. Also fennel, cabbage, and arugula. Isn't it surprising how excited you can get just watching stuff grow? I hope you get a great harvest.